The list below is from the Bermuda Government Emergency Measures Organisation (EMO). Stay indoors until the authorities declare the storm is over. Note that the All Clear announcement may not be made immediately after the storm passes because conditions may still make general movement unsafe. Do not move seriously injured persons unless they are in immediate danger of further injury. Give first aid, where appropriate. Clearance, search and rescue and other emergency vehicles will go out as soon as conditions allow. Call 911 or 295-0011 for help. Do not touch loose or damaged wires or anything that is touching them. Do not step in pools of water where such wires could be grounded. Avoid trees, signs, buildings and other structures that appear damaged. If you have been away from home, do not return until advised by the authorities that it is safe to do so. Stay tuned to the Emergency Broadcast station FM 100.1 MHz for recovery information. If your home has been damaged, enter with caution. Do not use candles or open flames, instead use a flashlight to inspect for damage. Electrical: Report fallen electricity poles and wires to BELCO, Police or Fire Services. 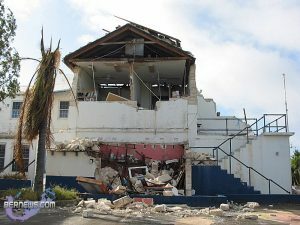 Property damage: Make a list of damage to your property. Before starting clean-up, take pictures of damage, inside and out. They will be important documentation for any insurance claim. If there has been window or roof damage, try to protect your home from further rain damage by covering exposed areas with tarpaulin. Continue to drink bottled water until your regular water supply has been tested safe. Check refrigerated foods for spoilage. Throw away any food that has come in contact with flood water as this may be contaminated. Listen for official information from the Emergency Measures Organization. Such information will include locations of post-hurricane shelters, and arrangements for relief and medical services. Use telephone for emergencies only. Telephone lines are frequently overwhelmed in disaster situations and need to be clear for emergency calls to get through.